Carl regularly spends some of his spare time listening to his old records from the 60's and 70's. More often than not, he will find a record or artist that will inspire him to create a new pedal. Sometimes it takes 2 or 3 records or artists to fully develop an idea! Now, think back to Jimi Hendrix and the Band of Gypsies, Robin Trower's Bridge of Sighs, or almost anything by David Gilmour, and the open your creative mind to the Purple Moon! It has taken a couple years on the bench for Carl to be satisfied because it has been developed with very creative guitarists in mind. 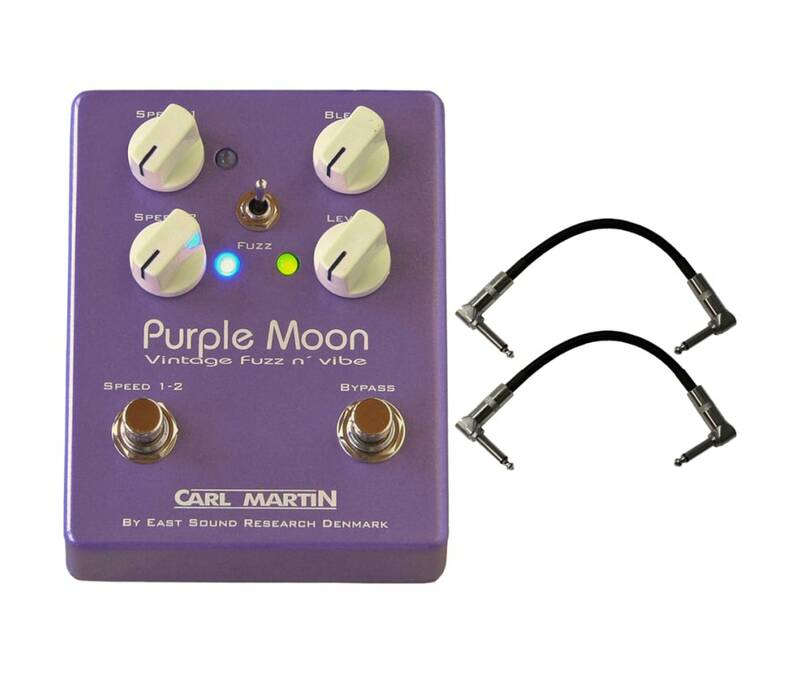 The Purple Moon is the only True Bypass, all analog, dual speed Vibe with Fuzz, and it is your ticket to recreating the same classic guitar sounds that inspired Carl. Like the rest of the pedals in the Vintage Series, the Purple Moon features a die-cast case with its own special color, mini knobs for ease of use, high quality switching, bright visible LED's and a choice of 9V battery power, or suitable transformer (they recommend using a quality regulated power supply for maximum response). 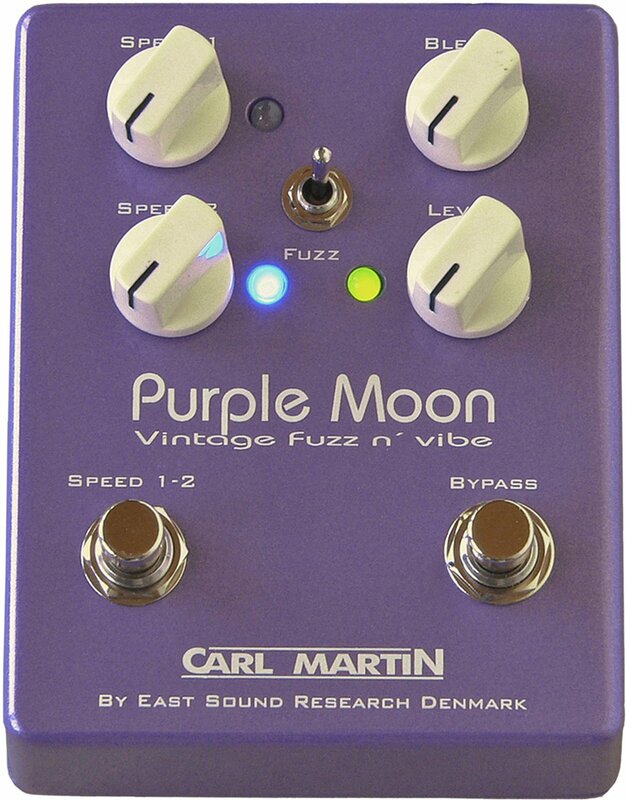 The Purple Moon is the only True Bypass, all analog, dual soeed Vibe with Fuzz, and it is your ticket to recreating the same classic guitar sounds that inspired Carl. Like the rest of the pedals in the Vintage Series, the Purple Moon features a die-cast case with it's own special colour, mini knobs for ease of use, high quality switching, bright visible LED's and a choice of 9V battery power, or suitable trasformer (we recommend using a quality regulated power supply for maximum response). The Bypass: The high quality Bypass switch is actually a True Bypass circuit, which means your guitar signal does not get interrupted by the pedal when the effect is turned off. A green LED lights up indicating the effect os engaged. The Fuzz knob The Fuzz control adjusts the amount of Gain/Fuzz you require, from 'barely there' to 'over the top'! The Fuzz Level knob adjusts the level of the Fuzz, it's ised to set the amount of vibe in conjuction with the Vibe, turned full counter clockwise the fuzz is bypasses.